Before I get to Hong Kong, have you seen the new Tom Bradley International Terminal at LAX? It is so nice, we considered just staying there the next six months. But we stuck with the plan, boarded our 14+ hour Cathay Pacific (really good airline) flight and landed in Hong Kong at 5:15 am on Thursday December 5. Hong Kong has been high on my list for years. It is a fascinating blend of East and West, old and new. Perhaps the expectations were a sliver too high. I was not as blown away as I expected, though in fairness I was sick the whole time and we mainly abstained from nightlife that I imagine enhances the experience. It is a great city, just not quite at the “best in world” level I had built up. The verticality is awe-inspiring, though. On my roof deck on New York’s upper east side years ago I liked to count how many 20+ story buildings I could see. I think I got into the 70s. I reckon this could be beaten handily in Hong Kong. Technological advancement was on display before even passing customs, as passengers must remove headwear so that an infrared thermometer can scan you for fever as you walk by without breaking stride. The airport express train was spotless and smooth and efficiently whisked us to Hong Kong Station in 24 minutes. Note that an individual one-way ticket costs HK$100 (US$1 = HK$7.75) but a pair costs HK$160. When we tried to use the machine at Hong Kong Station to buy our return tickets to the airport, we learned this deal is only available at the customer service counter. And that we could check our luggage there instead of at the airport, which is pretty amazing. There is a free shuttle bus from Hong Kong Station to various hotels, including our Holiday Inn Express Soho. There is also free WiFi in MTR (Mass Transit Railway) stations and many other locations throughout the city. Public transportation here is superb. In addition to the MTR, there is the legendary Star Ferry that crosses Victoria Harbour from Central to Kowloon for about HK$2, lots of bus lines, the old-school double decker trams and 16-person mini-buses. I am probably missing some, but anyway it is cheap, reliable and tourist friendly to get around. We never once took a taxi. After dropping our bags at the hotel, we started wandering the early morning quiet streets. This megalopolis sits just south of the Tropic of Cancer, so there is a somewhat tropical/jungle feel to go with the 7+ million residents. We saw butterflies on the sidewalk and banyan trees crawling down concrete. Dipping into Gilman’s Bazaar, we had perhaps our most enjoyable bites in the form of a HK$6 fresh-baked pastry that had some sort of delicious buttery sweet filling. We continued to the Victoria Peak Tram for some fabulous views and orientation. The Sky Terrace 428 (as in meters above sea) did not open until 10 am, so we did not have to decide between buying the ticket including entrance thereto for HK$75 return vs. the regular HK$40 return. It is cash only, unless you have an Octopus Card…which is worth looking into if you plan to use public transportation a lot. The tram ascends very steeply. There are several shops and restaurants at the top, along with a walking path. The air quality was pretty bad our whole time here, so if the photos look clear that is owing to Jenni’s editing work. Ready for our first dim sum, we waited outside a spot we thought was Dim Sum Square (recommended by our hotel) til it opened, only to realize we were a few doors off. The real spot was pretty solid, especially the crispy BBQ pork buns. On the island, white folks are abundant. It is much easier to get by with only English than I recall in Tokyo, though plenty of locals speak only Cantonese and e.g. ordering food in a non-touristy restaurant may not be straightforward, nor explaining your destination to a taxi driver. Which is why the one time we did attempt to take a taxi, we aborted the mission. It would be savvy to take a picture of your hotel’s address written in Chinese. Central and I think much of the island is very vertical, with major streets running east/west (at the same elevation), some north/south and lots of alleys and stairways going north/south. Man Mo Temple is around the corner from our hotel on Hollywood Road so we checked it out. 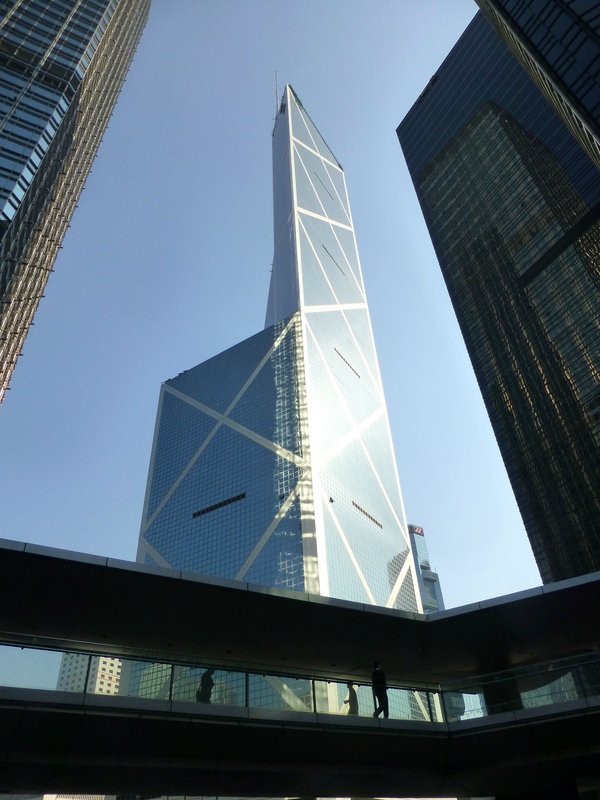 It is neat to see this building from 1847 amidst modern skyscrapers, and really that is a big part of why Hong Kong is special. You will constantly find in the same line of sight impressive, gleaming skyscrapers, crowded markets in alleyways and old Soviet-looking concrete buildings with so much grime that no power washer could conquer it. 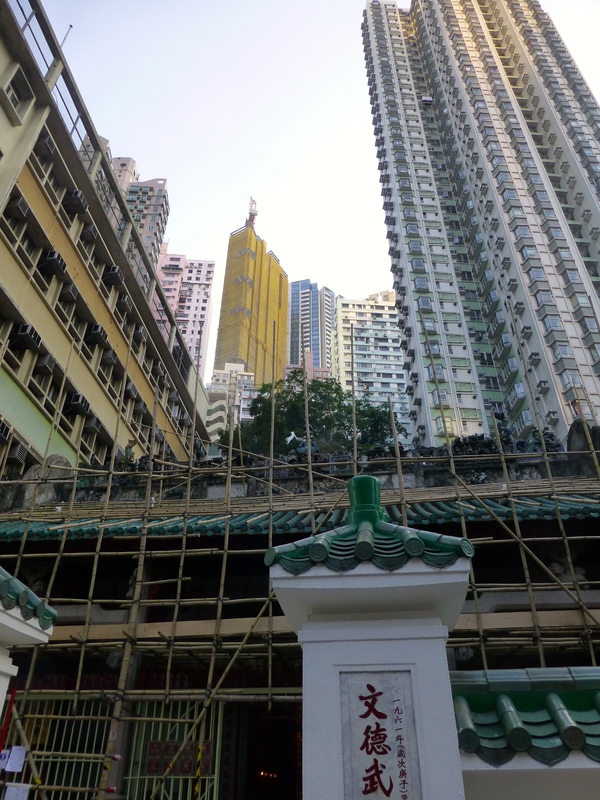 Hong Kong has a 118-story building and plenty of construction sites with bamboo scaffolding. The temple was not so exciting, but the copious incense coils and sticks create a thick, exotic air. Nearby are antique shops and some trendy looking restaurants. We entered Liquor Land on Staunton Street and the sales guy was hilarious. He greeted us with tastes of a California zinfandel, and we were happy to see they had bottles of Castoro zin, the same wine Jenni and I had at Treebones in Big Sur on our first trip together. So here we are, same same but different. Dinner at Mak’s Noodle on Wellington (one of my favorite streets with lots of action and markets/alleys to the side) was fine but nothing special. Earlier we sought Butao Ramen but could not find it, til wistfully we passed it a few doors down. At meals here you typically get hot tea right away and they bring you the bill just after you order (at least at casual places). Quite a contrast from Chile where you might wait many minutes after requesting the bill. And here is another theme for Hong Kong: efficiency. Nobody has time to waste. People run on and off buses. The escalators in the MTR stations move faster than the rest of the world. A guy seeming to work for Hong Kong’s government or tourist bureau interviewed us after we passed security for our departing flight, and I have never in my life seen someone get through 15 questions faster. Not sure I want to live this way, but I respect people being on their game. I also generally found people polite, if at times brusque. When someone knocks into you, they tend to apologize. I expect nothing of the sort in mainland China. Though we never stayed out late, it was apparent at once that the city comes alive at night. We were surprised how calm it felt our first morning, but that was before anyone went to work. Throughout the day and evening it became progressively busier. All those movie scenes where it is nighttime and there is some alleyway with neon showing through the steam of cooking noodles…well, Hong Kong to me felt like that. And I loved the rhythmic ringing of the walk / don’t walk signals. 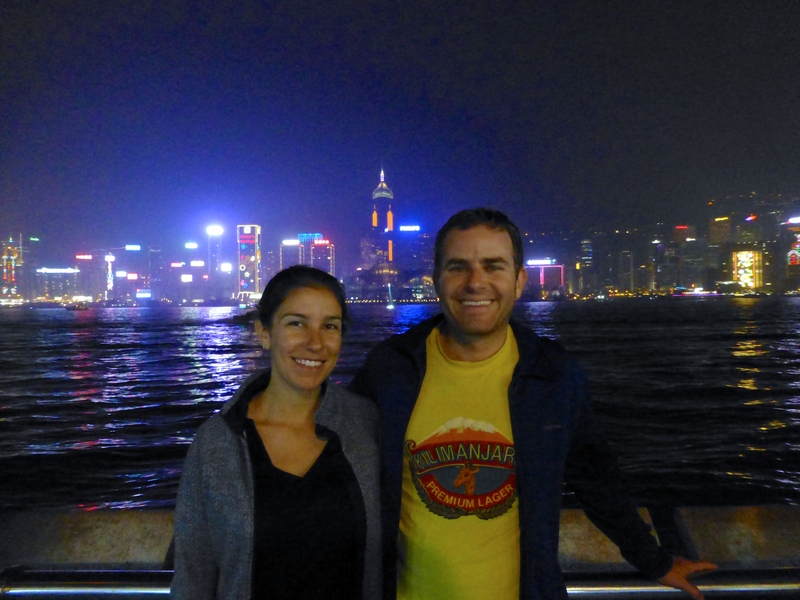 On Friday we took the Star Ferry to Tsim Sha Tsui in Kowloon. There are fewer whiteys here and far more attempts to hawk tailoring services and authentic fake watches. Or is that just because my jeans are kind of long and I wear a Casio? We walked up Nathan Road and into Chungking Mansions. If you are ignorant as I, you might think these are really expensive houses. But they are large buildings with Indian/Pakistani/Turkish etc. food stalls, electronics stores, apartments or hostels on upper floors etc. Apparently back in the day these were dens of iniquity. In modern times, it is where I got my first haircut of the trip (HK$50) from a Pakistani gentlemen who was the first to put the straight razor to my neck in many years. After passing through a little clothes market (I think on Bowring) we continued up Shanghai to a pleasant jade market. Long-term travel makes it easy to avoid buying things we do not need. We tried to get lunch at Full Cup Cafe but it was closed until 3 pm. It is on floors 4-6 of a nondescript building that you enter off an alley in the Mong Kok area. This reminded me of Kyoto and I would imagine this and other spots like it are quite enjoyable when open. Actual lunch was at Ajisen Ramen, and I am embarrassed to say we did not realize it is a Japanese chain. We just saw it was very crowded and ramen sounded good. Then sitting there it occurred to me a McDonald’s might be very crowded, yet this does not mean I should eat there (except at breakfast). Counterpoint: In-N-Out is a chain, and I should eat there. It was not half bad, though the extra spicy denomination for my bowl could give a false sense of confidence for Sri Lanka, which I am told has some of the spiciest food in the world. Ladies Market is loaded with iPhone cases and handbags and could easily be skipped, but the Fa Yuen Street Market had an impressive collection of seafood in a small space, including bags full of live frogs which I have not often seen. The Goldfish market (also selling lots of turtles) was less inspiring, though there are regular pet stores so we scoped some cute puppies, including a baby samoyed to remind me of my long-lost loves. Thanks, dad, for the great suggestion to check out Nan Lian Garden and Chi Lin Nunnery. This is an oasis of calm, with bougainvillea, neat lumber miniatures, Dahua colored scholars rock (aka jaspilite), etc. Across the street is the Plaza Hollywood mall. Even with just a few days we managed to hit a Starbucks. More important, what is a monk? Seriously, I do not know. Because I always thought monks were silent or at the least swore off material possessions. 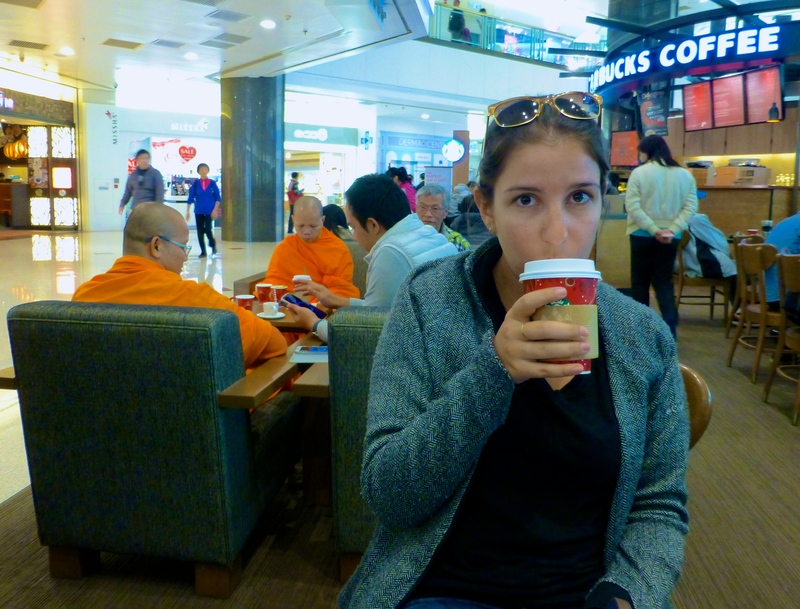 But now I see monks wearing fancy watches, playing with their iPads and drinking Starbucks. Is a monk just someone who does not work?? So if I start wearing a saffron robe all the time, would I now be a monk? Please enlighten me. More on the MTR…the stations are so nice. The trains seem a little wider than e.g. New York, and me likes smaller people with wider trains. You need to insert your ticket on entering and to exit, i.e. the fare is determined by the distance of your trip. The lady’s voice on the speakers advises you to keep your hand on the rail and do not keep your eyes only on your mobile phone. That evening we had drinks with Jody and his wife at La Piola, a bar/restaurant in Central very popular with expats. There are two levels and the bar is open to the sidewalk, creating a fun apres-finance atmosphere. La Cabane wine bistro on Hollywood was crowded, and we passed a pop up store. There is a vibrant and sophisticated air to this part of town. On Saturday we left the crowded city environs a while and took a minibus to Stanley on the southeast side of the island. The ride itself was worth the trip as we got to see so much more of the island, and the scenery was fairly impressive. We went through the tunnel and then drove some windy, hilly roads with views of a futuristic-looking aerial tram over an amusement park built on the mountainside, huge luxury apartment buildings, Repulse Bay, etc. The Ferrari dealership suggested there is money in this area. Stanley Market is pretty small and there is a waterfront walk with restaurants connecting this side of the bay to Murray House (with pricey restaurants) and Stanley Plaza. The whole area is quite touristy. Lunch at Momentito was forgettable. We had also considered Shek O beach nearby or Lamma Island, which I hear is quite nice. 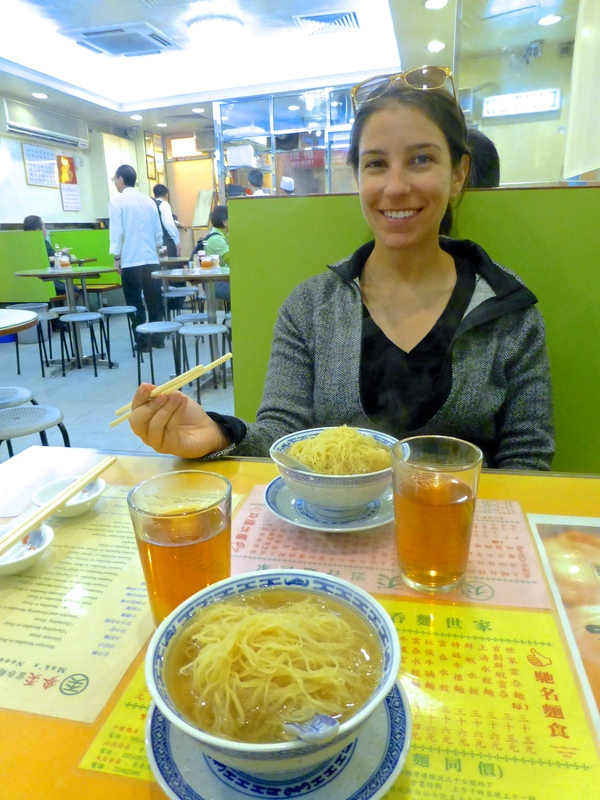 If we had more time or just were not sick, we might have visited Lamma island for some hiking and seafood. Sally said the Lamma Hilton (no relation) is a good spot for lunch. 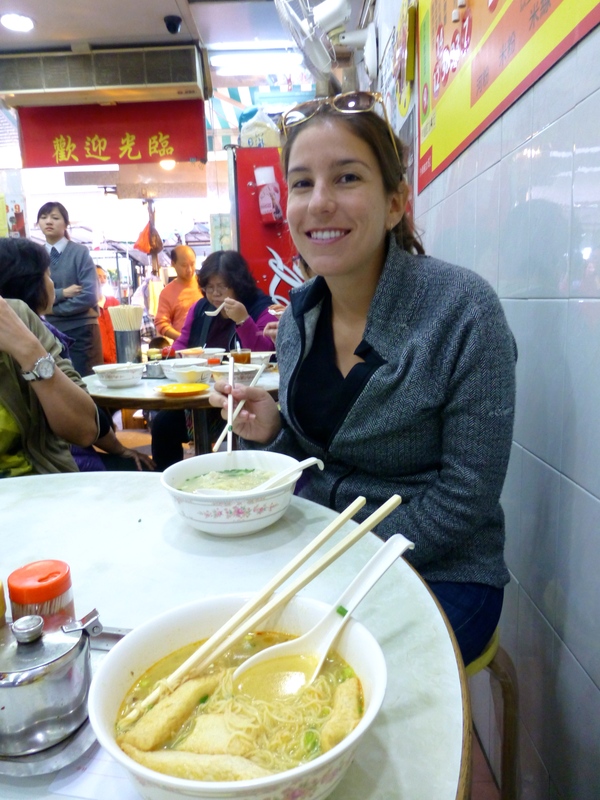 We also wanted to visit the Lei Yu Mun seafood bazaar on Kowloon but did not get around to it. 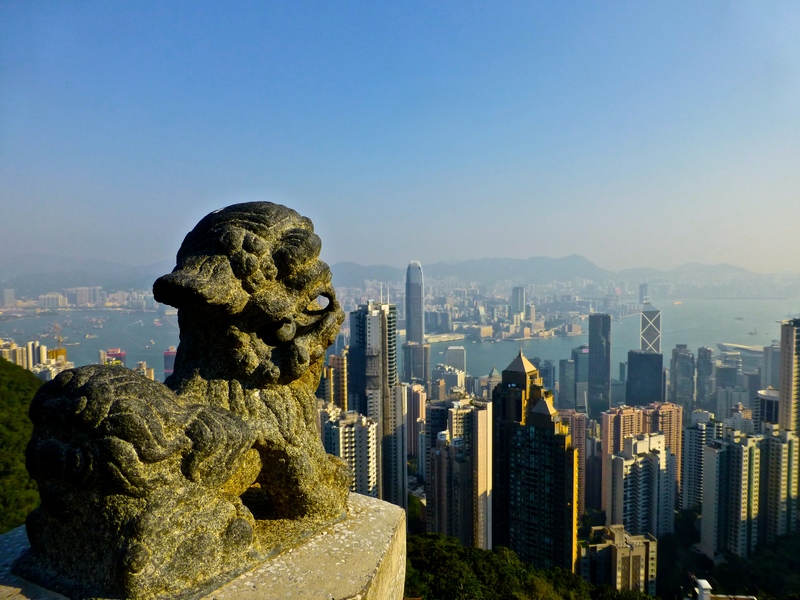 Nor the Sham Shui Po neighborhood in Kowloon or Macau, just a ferry ride away. Confused by the bus options home, we took a big double decker back to Central and grabbed a more proper lunch at Luk Yu Tea House on Stanley Street. This is a well-known place. The service is rumored to be gruff as part of the package, and certainly it was. We were not amazed but enjoyed the meal. Jenni ordered a black sesame roll expecting a pastry, and instead got something that looked like a cross between an eel and a fruit rollup. From here we passed through the Graham Street Market selling mainly fruits and veggies and then walked Gage Street with seafood and meat, including tongue and assorted organs. That evening we connected with Sally, our friend we met in the Galapagos islands in 2010 who has been living here a few years. Sally traveled by herself about 2.5 years straight through South and Central America, plus tons more at intervals. I do not cede the bigger balls title cavalierly, but Sally has earned it. 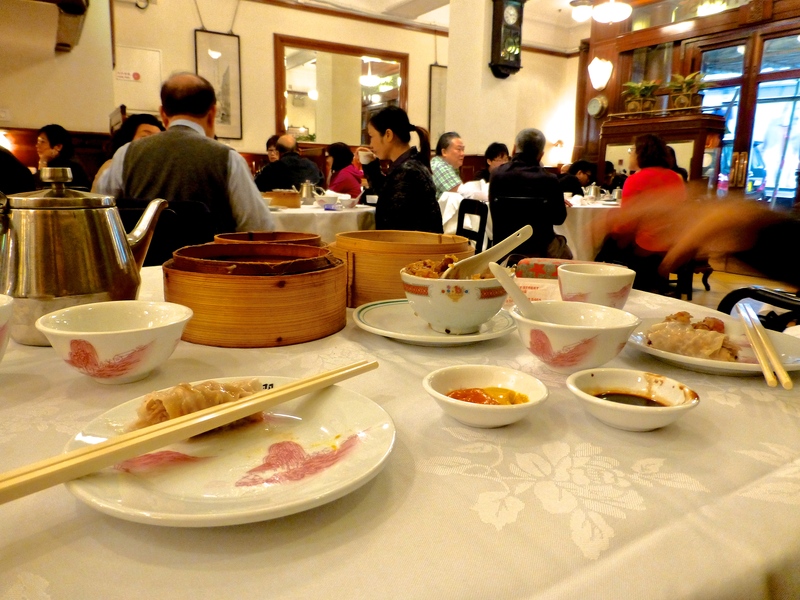 We covered the Temple Street night market in a handful of minutes then dined at Temple Spice Crabs. I planned to gorge on these spice crabs til the waitress said it cost HK$500. So instead we ordered what turned out to be pretty much a whole fried duck plus sweet and sour prawns and some large brewskis. We made it to Tsim Sha Tsui just in time for the nightly 8 pm laser show. It was packed, and apparently is every night. Seeing the skyline at night is a must, since it is so colorful and the smog is less offensive. Imagine New York’s skyline, only with the whole thing like Times Square and backed by mountains. I also saw squash being shown on a huge screen and then realized they were playing a tournament in a glass bubble right there. Ashley Road seemed lively and we had a nightcap at Ned Kelly’s Last Stand, where a jazzy band came on just before 10 pm. We took the Star Ferry back and then walked home. I like defining milestones, so Sunday’s was the first malaria pill of what will likely reach triple digits on this leg alone. 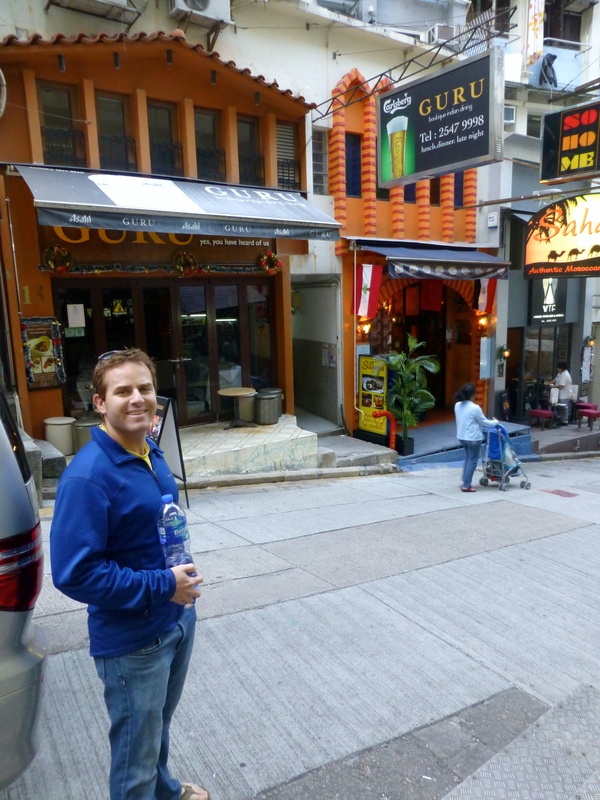 Then we took our first tram ride to Wan Chai which is a lively part of town to the east of Central, passing on the way workers who on their Sunday off lay out cardboard for picnic and conversation. 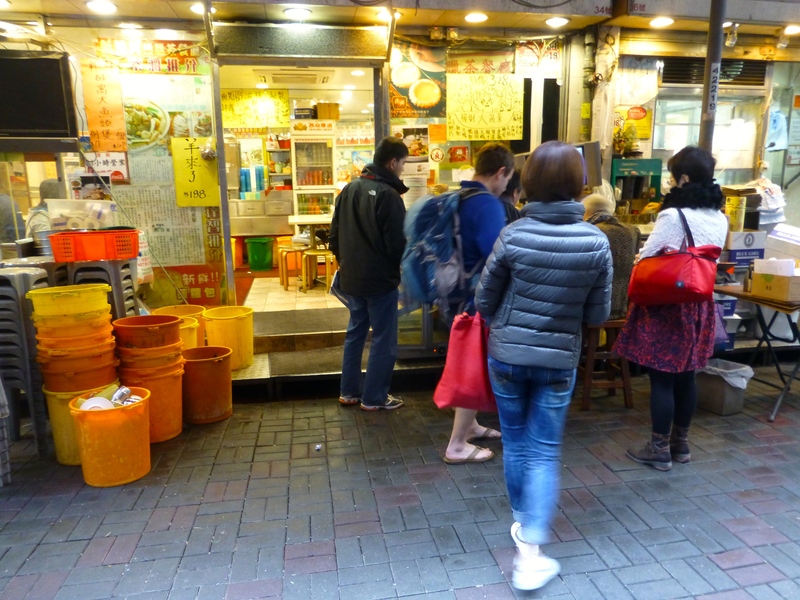 I liked the energy in Wan Chai and we ate at a locals spot (I think called Sun Hungyuen) in a market alley. Seating was communal, the chili oil was fiery and my noodles with fried fish balls (like lightly fried sticks) were priced right at HK$24. The markets have knick-knacks plus lots of meats, sausages, veggies, dried fruit, nuts, mushrooms, etc. I wish I knew what 1/5 of it actually is. When planning the trip I asked friends where to stay and the resounding response was “Central.” I agree with that. Clearly Kowloon is a reasonable option. After all, the new Ritz is there as is the Peninsula, perhaps Hong Kong’s most famous luxury hotel. But Central felt most like the unique, special Hong Kong I imagined. I might analogize it to New York. Sure Brooklyn may be cool and some would argue it has more flavor, but if you were visiting the city the first time for a few days and could afford it, I think it would be obvious you want to stay in Manhattan. This entry was posted in Asia, Hong Kong, Uncategorized and tagged hong kong, kowloon on December 9, 2013 by aleavitt77.